Pears need a location with good circulation where the ground is slightly elevated and sloping. This is because the trees bloom early and the flowers may be damaged in the spring by frosty air, which settles in low-lying areas. Pears should be grown in heavier soil types such as clayey loam with porous subsoil, or medium or sandy loam. Pear trees will not survive on ground that is saturated with water. Pear trees may be planted in the fall in mild climates or the spring in cooler ones. They should be set 20 feet apart, except the more vigorous varieties, which need to be spaced 25 feet apart. Soak the roots in water for 30 to 60 minutes before setting in the ground. The hole for the tree should be large enough to spread the roots about naturally. The soil should be worked in and around the roots to eliminate air pockets. There shouldn’t be a depression around the tree when you have finished planting and the tree should be set at the same level as it was previously growing. Water the tree thoroughly and check for air pockets, carefully lifting the tree to the correct level if it settles. When fertilizing your trees it is important not to cause overactive growth, which makes them more susceptible to the fire blight. When the tree is first planted, a half-cup of a balanced fertilizer may be placed in a 2-foot circle around the tree at least 6 inches from the trunk. This is done each spring until the fourth year at which time 2 cups may be set around the tree each spring. Pruning, which should mainly be done in the winter, should be light and just enough to develop a strong tree that is able to handle the weight of the fruits. When a one-year-old tree is first planted, it should be cut back to 3½ or 4 feet high and all side branches should be removed; this is done to compensate for the loss of roots during the planting process. At the end of the growing season, 4 to 6 main branches are chosen. They should be pointing in different directions and spaced about 6 inches apart. Remove the other branches. Pruning the subsequent years should be light and consist of producing a well-shaped tree with strong branches. Weak crotches are liable to breakage as they grow heavier; this can be prevented by cutting off one of the branches while it is young. On trees that are at fruit-bearing age, central branches that are thin and weak should be removed as well as any that are blight-infected. Pears are self-sterile and need more than one variety planted within 40 or 50 feet of each other in order to cross-pollinate. Seckel and Bartlett do not pollinate each other; therefore, they will need another variety for pollination to occur. In order to produce large fruit and prevent branches from breaking, the fruit will need to be thinned before mid-summer. 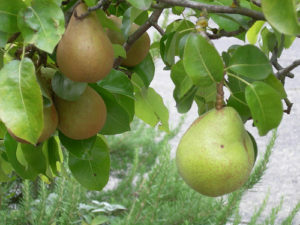 One pear should be left per cluster and the clusters should be approximately 6 inches apart. Remove the excess pears carefully to avoid damaging the others. Hold the stem with the thumb and index finger and push the pear off the stem with the other fingers to leave the stem attached to the spur. Pears are harvested greener than other fruits because they ripen better off rather than on the trees. Pears that are allowed to ripen on the tree turn brown at the core. Care must be taken when picking Pears because they have tender skin. They will ripen at room temperature in 1 or 2 weeks. Unripened pears should be stored as close to 32º F as possible. Contact us @ Orlando Outdoors!